We love our corn muffins in this household. Most of the time when I make cornbread I make it in muffin format. 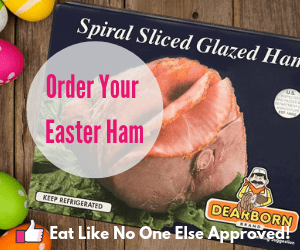 It makes it easy to distribute to guests. Plus muffins are just fun. I always on the look out for new recipes to try. I found one on a episode of Food Network’s “Giada at Home”, Giada shared a couple different corn muffin recipes. I was excited to give them a try. On a Sunday morning with no cereal in the pantry it was the perfect opportunity to bust out this corn muffin recipe. Below you will find my notes from this recipe. You can print the recipe of at Food Network’s website. 2. The recipe calls for buttermilk. I highly recommend you using buttermilk. For one it adds bring more flavor to the muffins as well as helping them be more light and fluffy. Did you know you can make your very own buttermilk. Check out these great tips from Olivia Rose at My King Cook. 3. 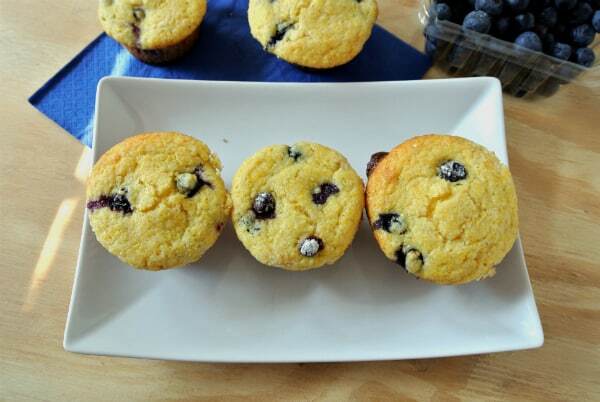 One key to keep the blueberries mixed throughout the muffin is to mix them with a little bit of flour. I was planning on doing this anyway but I am glad she mentions this. I also put some blueberries directly on top before baking. I wanted to make sure the blueberries were front and center for my pictures. 4. I used Bob’s Red Mill Fine Grind Cornmeal . Their corn meal are stone ground and have amazing flavor. 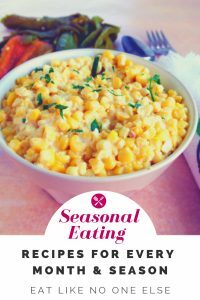 I recommend finding a stone ground cornmeal and to not just cheap out on the corn meal in this recipe. These muffins will only be as good as the cornmeal you use. 5. The amount of muffins this recipe makes it really more than 12. As you can see in the above pictures the muffins are overflowing. 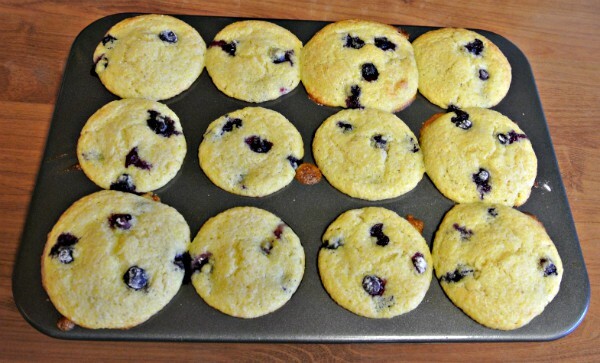 You probably really could get 13 or 14 muffins out of the batter, but who has a 13 cup muffin pan! 6. Giada said baking time was 20 to 25 minutes. I baked mine for 20 minutes. 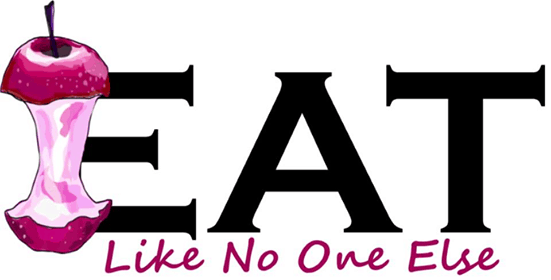 It all depends on your oven. I recommend you check them at about 15 minutes to see how they are doing. You want them to just starting to take on some brown color. These were pretty good muffins. They were very moist, which Giada keep repeating during the show. The buttermilk adds that nice tang. 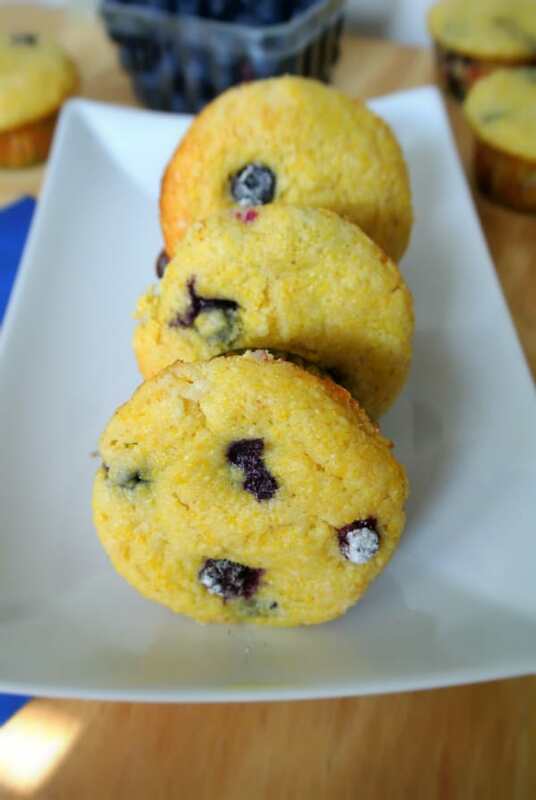 The blueberries are so good in muffins that I wondered why I never tried them in corn muffins before. There were some things I would change. I think they needed a bit more salt, maybe a 1/4 teaspoon more. I also missed the honey I usually have in my corn muffins. 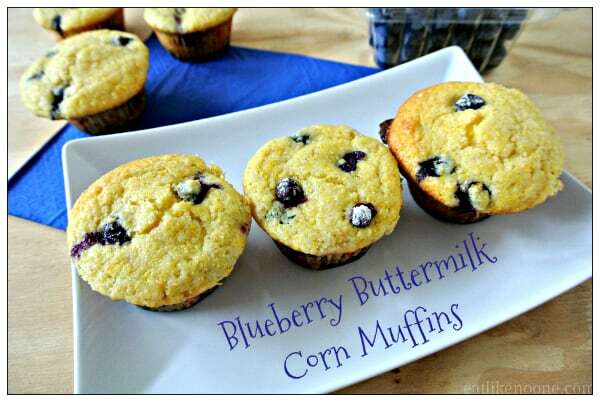 I think next time I make corn muffins I will use my old recipe with the addition of blueberries. By no means is Giada’s recipe a disappointment, my family still gobbled them up.